Nowadays the term «sustainability» is increasingly and inconsistently used. It is difficult for companies, farms and agricultural associations to evaluate their sustainability in a comparable way. This causes confusion among consumers and other buyers, who are not able to estimate how sustainable certain raw materials and food products were produced in reality. SMART – Sustainability Monitoring and Assessment RouTine – offers solutions. It is an innovative instrument for sustainability analysis and assessment of food production companies and farms and is based on the globally valid SAFA guidelines. It was developed by sustainability experts at the three research institutes FiBL Switzerland, FiBL Austria and FiBL Germany. SMART is not to be confused with a standard or label. However, as a tool for analysis it is excellently suited for the development of new standards and certificates. Essentially, SMART consists of a highly efficient data base as well as a scientifically based assessment method including a broad indicator-pool. 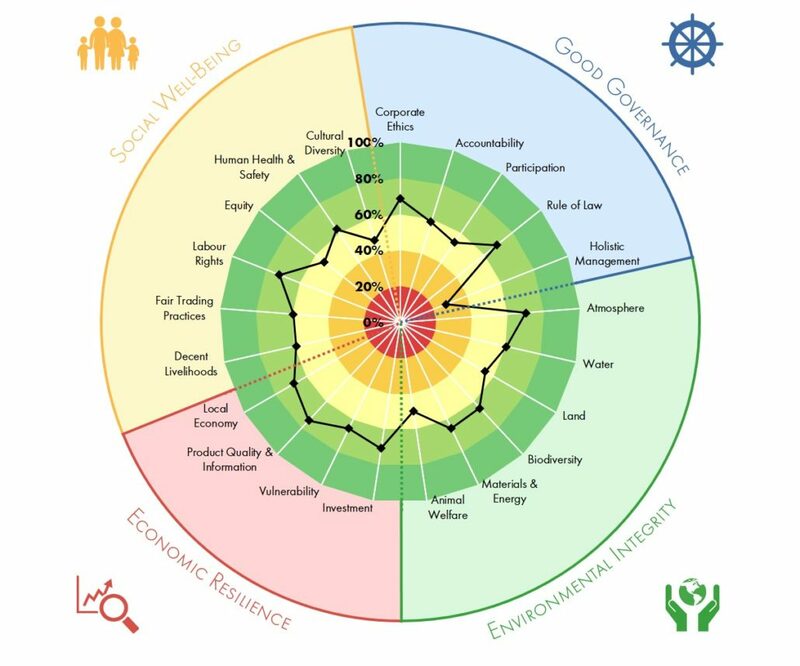 Sustainability performance can be extensively and holistically analysed but can also be evaluated in an authentic, transparent and comparable way. Through this process, SMART reaches far beyond previous approaches in the area of Corporate Social Responsibility and sustainability reporting. With SMART primary producers (agricultural and horticultural businesses) as well as food-processing companies or wholesalers, up to complex food corporations can be analysed and assessed. Despite its scientific basis and detailed analysis, SMART is very efficient and pragmatic in the implementation through its optimized method and for this reason often involves less effort than alternative methods. SAFA stands for Sustainability Assessment of Food and Agriculture Systems. 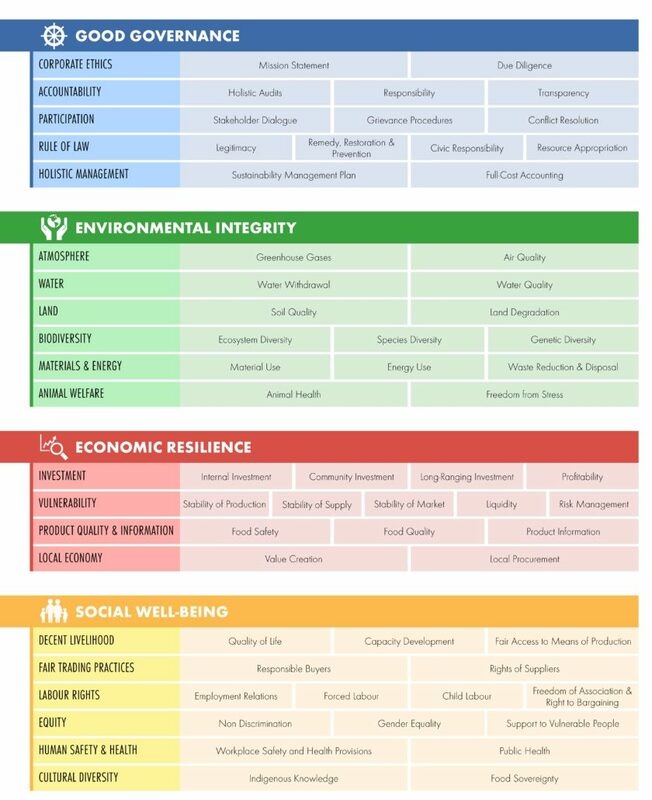 The guidelines define four dimensions of sustainability: “Ecological Integrity”, “Economic Resilience”, “Social Well-Being” and “Good Company Management”, which comprise of 21 themes and a total of 58 subthemes. For each of these subthemes sustainability performances can be assessed against defined standards. With these internationally acknowledged guidelines, a global framework with unified language provides a standardised, transparent and comparable sustainability assessments in the agricultural and food sector exist for the first time. You can find further information directly on the website of the FAO. Click here to download the SAFA guidelines. The method as well as the indicators were developed over several years by experts of FiBL and are regularly improved to include the latest science knowledge. To reach maximum acceptance, legitimacy and compatibility, further reference documents have been incorporated during the tool development, as for example the guidelines for sustainability reporting by the Global Reporting Initiative GRI-G4, the UN Global Compact, the ISO 26000 Guidance on Social Responsibility, the SA8000 Standard for Social Responsibility, the ILO Labour and Social Standards as well as the indicator matrix of the Economy for the Common Good. The assessment method contains, among others, the weighting of indicators according to the level of impact in certain SAFA subthemes. Furthermore, the area of influence and responsibility of each company as well as the time, location and causes of particular sustainability effects within the supply chain are considered. Before undertaking a SMART assessment, we check which themes and subthemes of the SAFA guidelines are relevant for a sustainability assessment. The indicators are selected accordingly, to be context-specific and individual for each farm or company. In case one or more themes are not relevant for the assessment, they will not be evaluated. However, in such a case the justification for excluding a theme is explained for transparency. This is not only according to the SAFA guidelines, but also compliant with the procedure of other Standards (e.g. the materiality assessment of GRI-G4). Companies and farms will often already possess a wide range of data in writing at hand. This data is checked during the data collection through the so called “Compliance Check” and is used in an optimal way. Therefore, information from e.g. certifications, audits, CO2-calculations or climate- and ecological assessments etc. can be seamlessly integrated; reducing the time taken for the SMART analysis. During a SMART assessment, we consider not only the procedures at the farm or company’s premises, but also the entire area of influence and responsibility of the respective farm or agricultural company within the supply chain. This area depends, among others, on the specific stage of the farm or company within the supply chain as well as on its size and market power, and is identified and defined in advance of the analysis. Example visualisation of the area of influence of a food processing company.. The area of influence can contain prior steps within the supply chain – up to the primary producers – as well as later stages all the way through to the consumer. For products, the complete life cycle is taken into consideration, starting with the production of raw materials through to the disposal/recycling. Thereby, areas of direct and indirect influence are differentiated. The area of direct influence concerns all processes taking place on the business premises as well as all processes connected to suppliers or buyers on which a direct influence is involved; for example in very close business relations or even interdependencies. The area of indirect influence includes all areas that are only affected by activities in an indirect way, as for example when procuring agricultural raw materials through intermediaries. The highest ecological and social impacts of the company activity often emerge within the prior stages of the supply chain, therefore significant importance is placed on considering the indirect area of influence. The attached visualisation shows the area of influence of a food processing company as an example. Using a defined assessment method, the agricultural business or company is assessed against individually selected indicators to identify how well it performs in achieving the pre-defined sustainability goals of the 58 subthemes published in the SAFA-guidelines. This achievement of goals is assessed on a five-step scale from red (insufficient) through to dark green (goals fully achieved/ maximum sustainability). This scale is also used for the visual presentation of the results in the radar diagrams, in which the achievement of goals is shown as a percentage. If you have further questions about the method or functioning of SMART or about specific steps of the analysis by SMART, do not hesitate to contact us. We will be glad to provide you with further information.